Join Christy for this annual yoga retreat to welcome the spring! 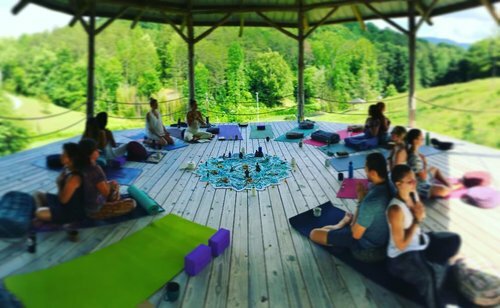 Connect with the Divine feminine within through 3 days of fresh mountain air, yoga, nourishing food, and ceremony. Awaken and connect with yourself as the flowers and nature emerge from winter hibernation. ​This weekend is an opportunity to come together for an educational experience in regenerative garden design, trail building, community organizing and the many facets of permaculture. We will gather as a community to learn by doing. Lose yourself in the flow of Vinyasa Yoga as you build strength and clarity. Explore the ancient forests of the Smoky Mountains as we hike to Spruce Flats Falls. Join us on this Tennessee yoga and hiking retreat to give your mind, Body and soul some TLC. Join us for a fun filled weekend as we explore the ancient science of Ayurveda through the qualities of food. Together we will learn through hands on cooking, yogic movement, and deep discussion. Dive deep into the doshas, gunas, herbs and food, and of course kitchen asanas - little practices to stay healthy in our daily lives! RESTORE ME is a weekend retreat that celebrates all we are as women. The weekend combines art, writing, movement, meditation and safe women circles into place that allows you to rediscover yourself in a serene natural setting. This retreat is about collectively coming together to create a safe space of discovery and relaxation. This year’s RESTORE ME retreat theme is “I AM ENOUGH”. We want to take back our power and appreciate ourselves. There is no task too small that we cannot celebrate. We will rejoice each other in a sisterhood celebration of YOU. Every woman is a mother in her sacred nature, and every mother deserves to take some time to shower herself with love and nurturing. Make this your time to indulge in what you need most. We will offer healing yoga practices, making and enjoying natural facials and foot scrubs, dessert making (and eating! ), massage, and some quiet, restful time to reconnect with your Self and the nature around. ​This springtime intensive is designed to give you a wide range of tangible tools that can be incorporated into your teaching right away. Alongside advanced yogic wisdom, you will receive the opportunity to dive deep into your personal practice of meditation, pranayama and bhakti as well as creative, holistic asana. This course gives credit for Yoga Alliance Continuing Education, as well as can count towards a 300hr YTT through Kula Collective! ​As summer begins to blossom in the mountains, rivers, and forests, it is a perfect time to align our intentions to find our balance. This 25-day journey provides the time and space to explore your Self, letting you emerge feeling supported, inspired and full of the breath of new beginnings, with a clear direction for following your passion and your purpose. Successful completion of this course allows for Yoga Alliance registration as a 200hr Registered Yoga Teacher from Kula Collective. ​We understand how overwhelming it can be to design learning experiences, which is why we created this Facilitation Intensive. We believe that by providing better learning opportunities in all areas we can unlock our collective potential and solve all the challenges humanity is facing. No matter what topic you are facilitating you can improve your students’ learning through guided practice in a community of compassionate peers. This course can be used as 50hrs of credit towards Yoga Alliance Continuing Education requirements. ​Allow your body to fully relax during restorative yoga sessions and learn new meditation techniques to bring more peace into your life. 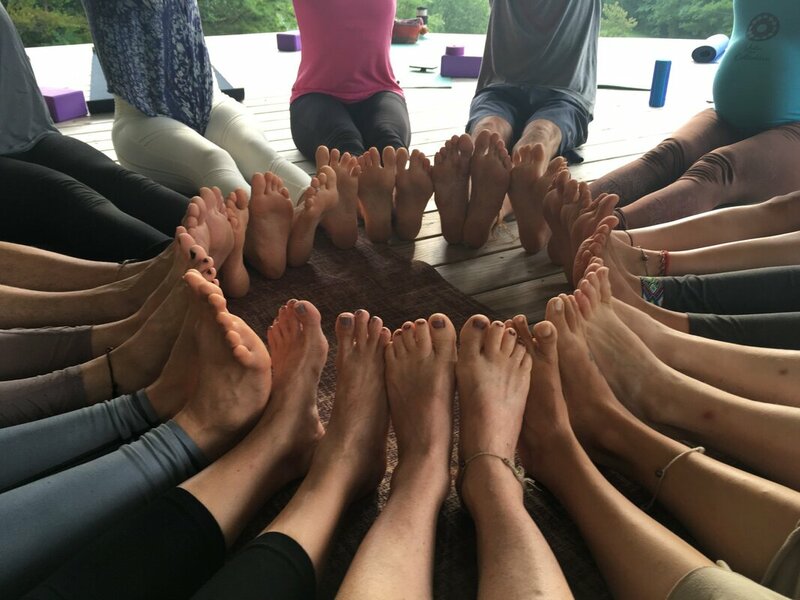 Join us on this Tennessee yoga and mediation retreat to give your mind, Body and soul some TLC. ​This retreat will help you to discover the best version of yourself through yoga, mindfulness, exploration and adventure. Learn and practice Vinyasa and Ashtanga Yoga, proper alignment, Pranayama and Meditation techniques, Yoga Philosophy, Ayurvedic food as medicine and the the importance of routine. In addition we will spend time journaling, hiking, adventuring, relaxing, and building intentional community; the feeling that life is best when shared. ​This fall intensive is designed to give you a wide range of tangible tools that can be incorporated into your teaching right away. Alongside advanced yogic wisdom, you will receive the opportunity to dive deep into your personal practice of philosophy, energetics and therapeutics as well as personal development to move towards living your dharma. This course gives credit for Yoga Alliance Continuing Education, as well as can count towards a 300hr YTT through Kula Collective! As women, our spirit thrives on creative expression, yet we rarely give ourselves the time and space to simply be still and listen — and to follow the invitation of our heart. During this weekend retreat, we’ll loosen resistance, expand awareness and experience the lightness of spontaneous soul play. We’ll practice meditation and yoga, express through writing and visual art, and dare to move and dance! Together we’ll re-ignite and embolden the creative spirit that lives within each of us - giving us renewed clarity, connection, and vitality to bring back into our daily lives. No experience is required and all levels are welcome. What if women need to get lost and wander? What if integrity means allowing your truth to change and flow with you? How do we connect the many energies at play within each of us? During this women’s retreat, we’ll renew our self-trust, explore our depths, honor our expression and validate our embodied intuition. We’ll wake to meditation and yoga, express through writing and movement, and gather for stories around flames in the forest. Myths hold a hidden power that we can unfold: they gift us maps, keys, mirrors, legends and paths back to ourselves. We’ll heed the call to honor the wisdom we carry within our stories and voices and bodies, and between each other. Surrender to deep stretches during yin yoga sessions and learn meditation techniques that will bring more clarity into your life. Join us on this Tennessee yoga and meditation retreat to give your mind, Body and soul some TLC.